Continuing with my two-year-old son, Pickle. As I laid out last post, Pickle is a cyborg. A Type 1 diabetic, his life literally depends on computers that are attached to his body. Because of him, I find myself contemplating the fact that we are almost all professional cyborgs. Technology is now an inescapable element of delivering legal services. The objection that using technology somehow differs from ‘real’ lawyering is misguided. If it affects the outcome or the bill, it is real enough. Still, just because technology is essential does not mean it is all that good. With respect to my diabetic Pickle, I have one question: where the @#%& is his artificial pancreas? My wife is also an insulin-deficient cyborg, I have therefore been reading the same damn story about the same pending breakthrough for over a decade (e.g., 2006, 2011, 2016). We are eternally on the cusp of the machine finally replacing humans in the labor-intensive process that is monitoring blood sugar levels and delivering insulin when necessary. Pickle has a continuous glucose monitor. But it needs to be calibrated multiple times a day. And it is not accurate enough to be relied on for dosing insulin. So the monitor does not obviate the need to regularly prick his fingers and draw blood to check sugar levels. Indeed, the best commercially available glucose monitor is actually a trained dog— the repurposing of 26,000-year-old technology and more evidence against functional fixedness. But a dog, like the monitor he actually has, cannot communicate with his insulin pump, which still needs to be run manually (i.e., we still have to direct the pump to dose insulin). The cycles of hype and disappointment around an artificial pancreas gives me quite a bit of sympathy for older lawyers who have been through many such cycles re artificial intelligence. As a stand-in for older, successful lawyers, I am going to assume a law school graduation year of 1977 since that is the median and modal graduation years of the chairs of the AmLaw 10. They have been hearing how machines were going to replace them since long before they took the bar. In from three to eight years we will have a machine with the general intelligence of an average human being. I mean a machine that will be able to read Shakespeare, grease a car, play office politics, tell a joke, have a fight. At that point the machine will be able to educate itself with fantastic speed. In a few months it will be at genius level and a few months after that its powers will be incalculable. 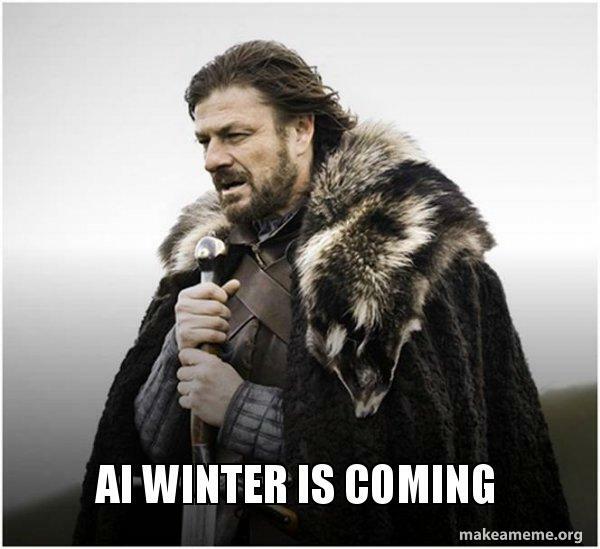 Instead, their law school graduation in 1977 was at the tail end of the first AI winter–a period of reduced interest in AI due to its failure to live up to the hype. Elsewhere in 1997, our successful lawyer had been a partner for more than a decade and practicing for two decades. The home computer market had not yet broken 40%. The still nascent home internet market had not yet cracked 20% penetration. In developments that would actually make an impact, the domain and famous spelling error www.google.com would be registered, almost a year before the company would be incorporated. Social security will have to be expanded, introduced at lower and lower ages, till essentially everyone lives on social security. The taxes will be paid by fully-automated businesses run by robots. And human beings have to deal with the problem of excess leisure…I am afraid that the long term future we are building will have no space left for human beings…a world where we have these robots and better and better artificial intelligence, where systematically those systems replace humans, human services, human work…Is it a good or bad thing if robots become our natural successors and we fade into extinction? But evidence of true machine intelligence outside of very narrow domains like chess remained illusory. As a practical matter, the tangible breakthroughs were mostly about being able to take the office with you everywhere. In 2007, Blackberries were a thing, and Apple announced the iPhone. We are closing in on 2017 when our successful lawyer will celebrate 40 years in practice with more than 30 of those years as a partner. Much closer to the end of their career than the beginning, they can still read the same damn story about their imminent obsolescence. Or they can read the counterprogramming. We should forgive them for being a bit skeptical. Returning to my understandable focus on the perpetual promise of the artificial pancreas. In fixating on a closed system that eliminates the human factor post installation, I miss the genuine progress being made. What used to be a death sentence is now an inconvenience. And that inconvenience has gotten considerably easier to manage now that we can do things like monitor my son’s blood sugar remotely on a watch–continuous glucose monitor links to his iPhone; his iPhone transmits to my wife’s iPhone; her iPhone transmits to her Apple Watch. None of those devices were commercially available when my wife was diagnosed a decade ago. That is amazing even if it is not the technological nirvana we were promised. Because the story I told above focused on the more sensational claims of machines making humans obsolete, it treated the PC, the internet, and mobile as inconsequential asides that only served to demonstrate the hyperbolic nature of the press coverage. But like a good lawyer, I could use the same facts to tell a very different story in which technology crept into every aspect of our professional lives. There will be real similarities between the immediate lived experience of a lawyer who graduated in 1977 and the one who graduates in 2017. But there will also be real differences that would have seemed like bad science fiction to someone entering an analogue professional environment four decades ago. Imagine that each kind of jobs that humans do requires a particular level of computing power in order for computers to replace humans on that job. And imagine that these job power levels are distributed lognormally. In this case an exponential growth in computing power will translate into a linear rate at which computers displace humans on jobs. Of course jobs may clump along this log-computing-power axis, giving rise to bursts and lulls in the rate at which computers displace jobs. But over the long run we could see a relatively steady rate of job displacement even with exponential tech gains. Which I’d say is roughly what we do see. For our successful lawyer, however, the felt impact of technology progress on their professional accomplishments may be less than linear, it may be negligible. This has consequences for how lawyers in position of power react to those of who emphasize that we are all cyborgs now. More on that in Part 3. D. Casey Flaherty is a consultant who worked as both outside and inside counsel. Find more of his writing here. Connect with Casey on Twitter and LinkedIn. Or email casey@procertas.com. *I’m way too dumb to have a smart take on the timing of general artificial intelligence. But the implications are so profound that it almost makes them not worth talking about. It would be similar to debating how the legal profession might change if the Earth were again struck by a meteor like the one that wiped out the dinosaurs. Everything changes, and almost no one is going to care what effect it has on profits per partner. Until then, I am in Ryan’s camp. It is only AI/magic until we start to use it, then it is software. It is only a human-displacing robot until we start to rely on it, then it is a dishwasher.